Republished July 14, 2016, to correct an error. Prices of carbon dioxide (CO2) emission allowances in the Regional Greenhouse Gas Initiative (RGGI) have fallen for the second auction in a row, to $4.53 per short ton of CO2. The auction prices on June 1 were 40% below their previous peak value of $7.50 per short ton of CO2, reached on December 2, 2015. RGGI is a cap-and-trade program established in 2005 in nine states, primarily in the Northeast. 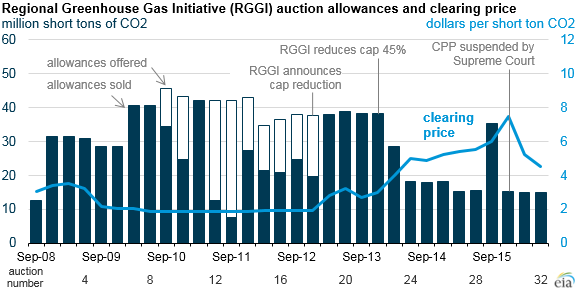 Auction prices had generally increased since December 2012, around the time RGGI announced the intention to reduce CO2 emissions caps by 45% by 2014. Since the announced cap reduction, the auctions have tended to sell all allowances offered. In February, the U.S. Supreme Court suspended enforcement of final regulations issued by the U.S. Environmental Protection Agency in August 2015 to implement the Clean Power Plan (CPP), a national program to reduce CO2 emissions from existing power plants, pending judicial review. In the subsequent RGGI auction in April, the auction price fell to $5.25/short ton CO2. RGGI has yet to establish targets beyond the current cap of 78.2 million short tons of CO2 emission by 2020, adding to uncertainty about the future value of emissions allowances. Despite the suspension of the CPP, some states are continuing to develop compliance plans. Many states see cap-and-trade programs like RGGI as their main strategy for compliance with the CPP. Some states participating in RGGI, including most recently Maryland, already have established CO2 emission reduction targets post-2020 independent of the CPP and the RGGI process. RGGI is currently going through its 2016 Program Review, which will set the trajectory of the post-2020 cap. The review process will also focus on possible adjustments that can be made to the policy. These adjustments include cap decline rates, flexibility mechanisms (such as a cost containment reserve), and opportunities to link the policy to the CPP. EIA includes RGGI in the Annual Energy Outlook 2016 (AEO) Reference case by assuming that the 2020 cap will remain flat post-2020 until the end of the projection period in 2040. EIA's Reference case projections include current laws such as the extension and phase-out of federal renewable energy tax credits, as well as the enforcement of a CPP assuming a mass-based cap on carbon emissions. In this projection, RGGI states are already expected to be in compliance with the CPP when the compliance period begins in 2022. The states currently participating in RGGI are Connecticut, Delaware, Maine, Maryland, Massachusetts, New Hampshire, New York, Rhode Island, and Vermont. Near-term electricity demand growth in the Northeast region, which covers most of the states participating in RGGI, is largely met by additional renewables, with additional natural gas-fired generation, mostly from combined-cycle units, expected to play a larger role beyond the early 2020s. The Northeast—already one of the least carbon-intensive electricity generation regions—is expected to further reduce its power sector carbon intensity from 1,037 pounds of CO2 per megawatthour (lbs CO2/MWh) in 2015 to 986 lbs CO2/MWh in 2030. Note: The Northeast region includes all RGGI states except Maryland and Delaware.